Ex-Watford owner Laurence Bassini is in talks to buy Bolton from Ken Anderson, while players and staff are still waiting to receive their March wages. "It's a big week for the club," said Parkinson after Saturday's win at QPR, which left them five points from safety near the bottom of the Championship. "We really hope that the club can have a stable platform to go forward." Owner Anderson said last week the club could be sold "within 48 hours", but a deal is yet to be done. 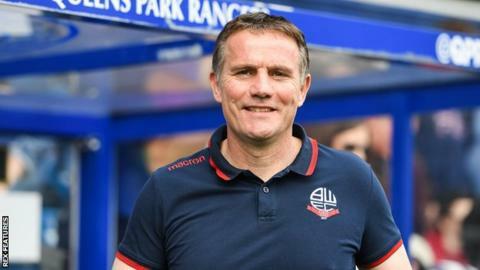 And on Wednesday, Bolton are due back in the High Court over a £1.2m unpaid tax bill and other debts, with the club at risk of going into administration if they are not settled or a takeover not agreed. "These players have been through a lot and there was another episode with the wages this week," added Parkinson, whose players were also paid late in February alongside coaching and administrative staff. "But they're an honest group of professionals who stuck together and represented the club in a way which is befitting. "In any walk of life, if you go to work and there's a concern about your wages coming in then it can affect morale. "We spoke about that at length with the lads and I feel we've done our bit in terms of the responsibility of trying to lift the training ground."